Bay Scallop season opens this coming week on Martha's Vineyard. This is one of my favorite recipes, adapted from local chef Joe DaSilva. Looking for other dinner cooking ideas for this local ingredient? Check out my article in the MV Times. butter, salt and pepper to taste. scallops. Remove the small muscle on the side of the scallops, rinse well and dry. To make the sauce, bring a small pot of water to boil. Add the basil leaves and boil for 30 seconds (this keeps the sauce bright green). Drain and pat dry with a paper towel. Add blanched basil to a blender with 1/2 cup olive oil, enough to blend easily. Blend until thoroughly mixed, about 1 minute. Strain in a fine-meshed strainer. Season with a pinch of salt. and sear the other side, 1-2 minutes. Season with salt and pepper, and a few drops of lemon juice. around. 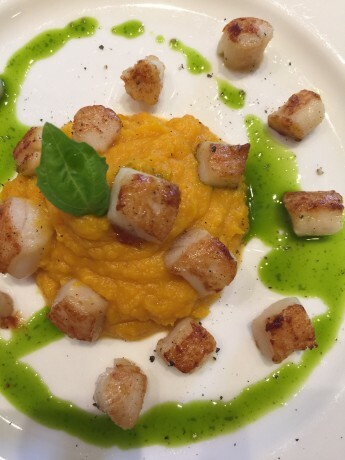 Add a squeeze of lemon to the basil sauce and drizzle or spoon around, not on, the scallops.